Single Touch Payroll is now an official requirement for every Australian employer. The law was passed on February 11, 2019, mandating that every Australian business comply with the Australian Tax Office initiative, known as Single Touch Payroll. Whether your small business employs 1 or 20 employees, everyone needs to get on board from July 1, 2019. So what does this mean for you and your business? Single Touch Payroll is an government-initiative that changes the way businesses report their employees’ tax and superannuation information. The change in reporting means that information is sent directly to the Australian Tax Office every time a small business completes a payroll cycle. Read more about Single Touch Payroll. What are the benefits of STP? Ultimately, Single Touch Payroll is designed to streamline the reporting process and minimise errors. It will eliminate the need for businesses to provide payment summaries or a payment summary annual report to the ATO. Find about more about the advantages of Single Touch Payroll. Businesses that have 20 or more employees began reporting using Single Touch Payroll from July 1, 2018. Now, all businesses, including those with only 1-19 employees, will have to officially use Single Touch Payroll as of July 1, 2019. You will need to ensure you are using an accounting software solution that is Single Touch Payroll enabled. 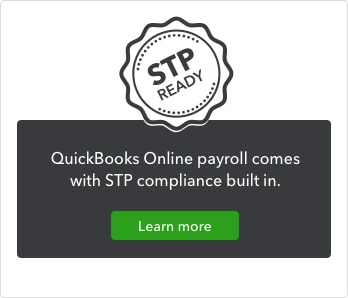 Fortunately, QuickBooks Online integrated Payroll, powered by KeyPay, is already STP compliant. Find out more about QuickBooks Single Touch Payroll Solution.